The addition curing, elastomeric alginate substitute xantasil removes time pressure from the process of creating anatomic impressions. You can pour the impression later and pour it multiple times due to its impressive dimensional stability, since it has such impressive shape stability. It also means that there is no need to take several impressions. xantasil® – The alginate substitute adapting to your workflow. For your flexibility: The long-term dimensional stability enables also a later and repeated pouring without time pressure. For your comfort: The impression is more convenient for patient and dentist due to its hygienic processing, short time in mouth and reusability. For your routine: The especially fast automatic mixing with the Dynamix speed ensures an excellent and reproducible mixing quality. xantasil covers all anatomical impression indications for which traditional alginates would typically be used. 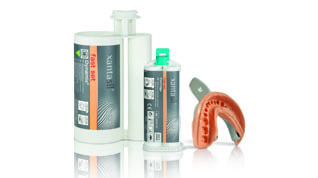 The addition-curing, elastomeric alginate substitute will give you robust impressions with long-term dimensional and storage stability every time.